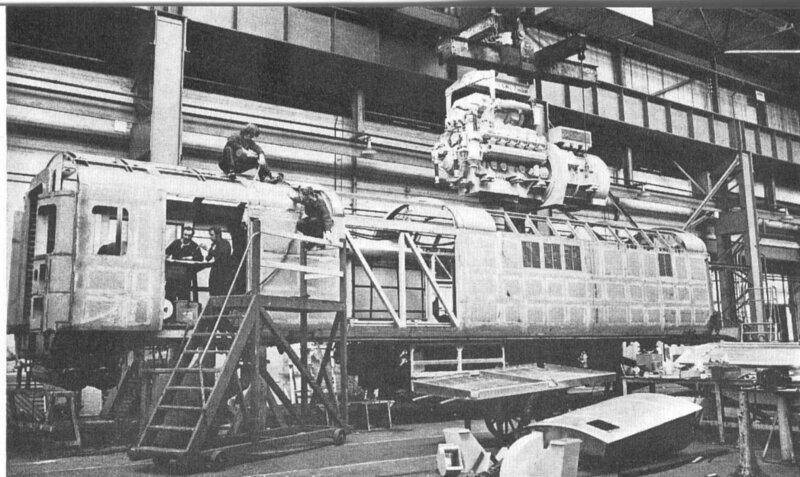 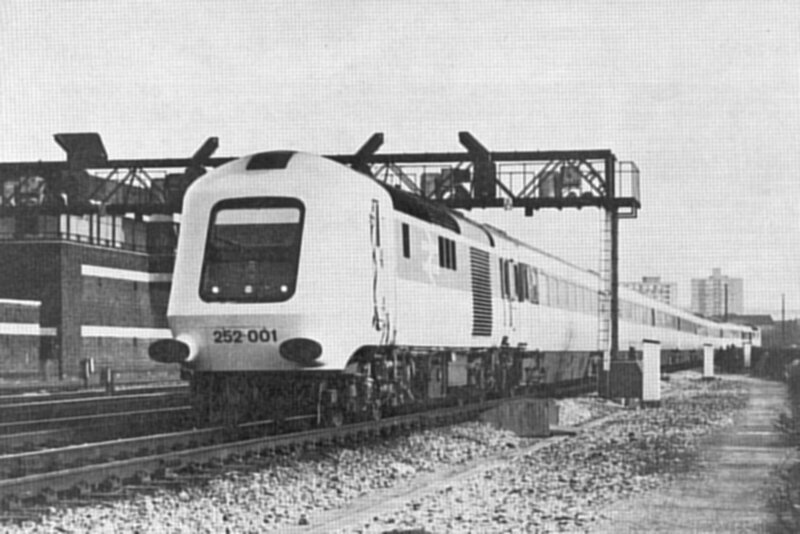 Often said to have been a stopgap before the introduction of the Advanced Passenger Train, the prototype High Speed Diesel Train (HSDT), as it was originally known, owed a great deal of its design to the Western Region of BR. 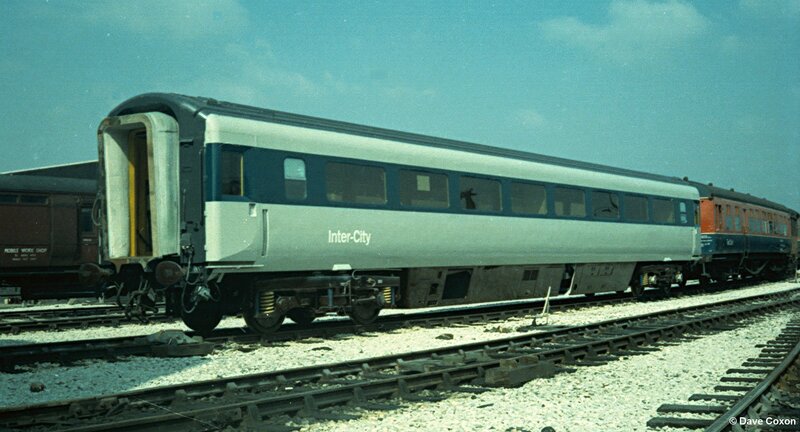 A large number of design staff at the RTC in the early 1970's came from Swindon and the BT10 (or DOC3) bogie was certainly of WR parentage. 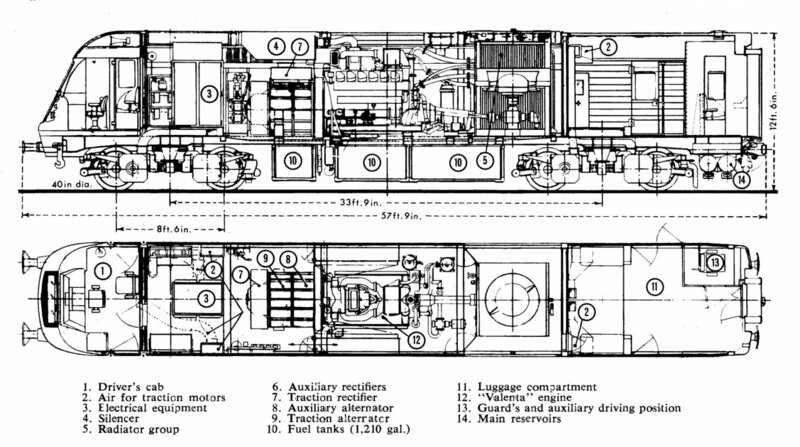 The power cars were equipped with Paxman Valenta 12RP200L, 2,250 HP 12-cylinder marine engines chosen for their high power to weight ratio but although the vehicles had been built with sufficient room for a much larger 16-cylinder version these were never fitted. 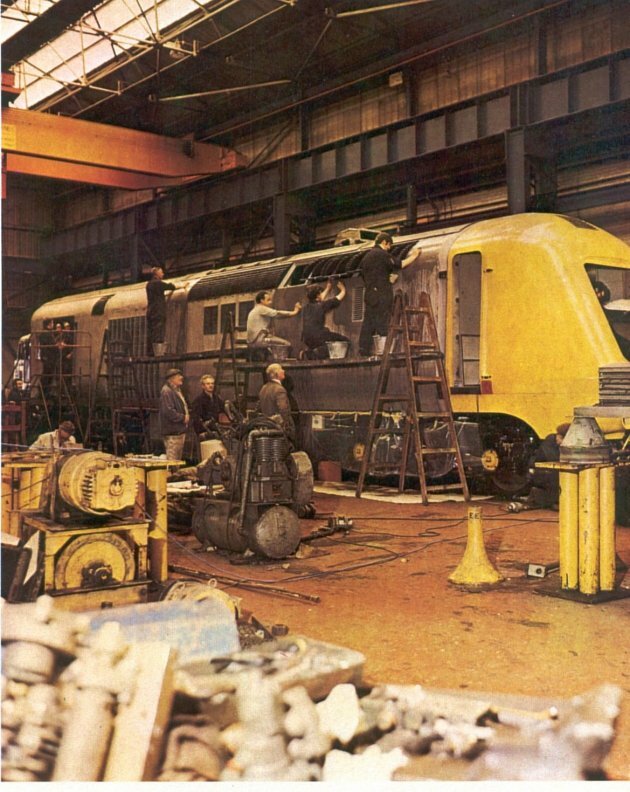 Authorised in August 1970, only 22 months later the prototype vehicles arrived at the RTC in the summer of 1972 where they underwent safety checks in the specialist workshop. 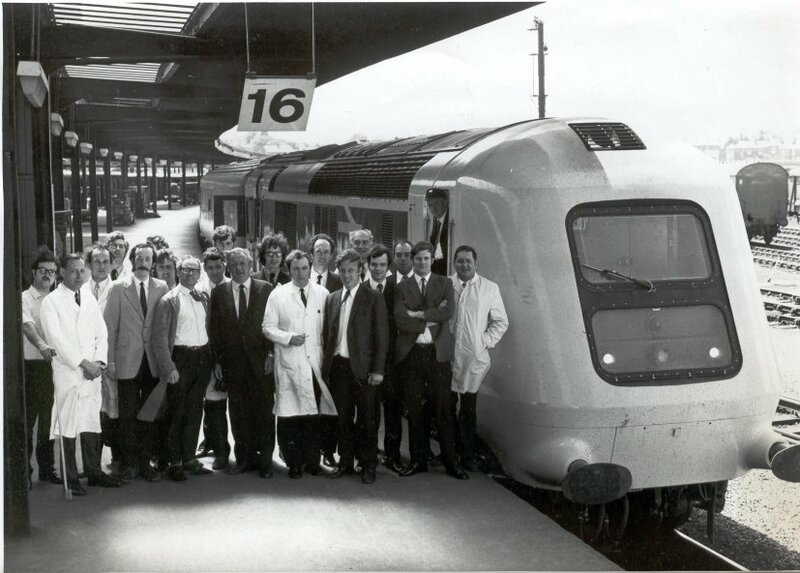 Later the train was instrumented prior to starting its intensive and stringent type testing. 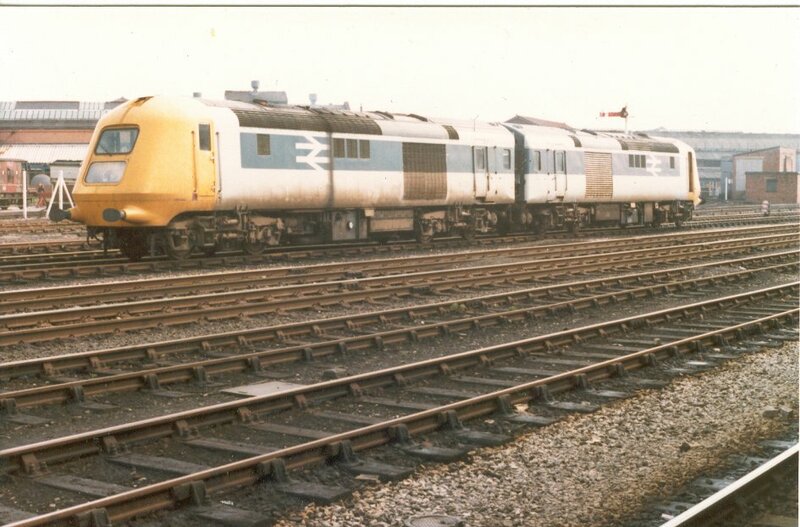 Click on the picture for a bigger image - All photos are the author's unless otherwise credited. 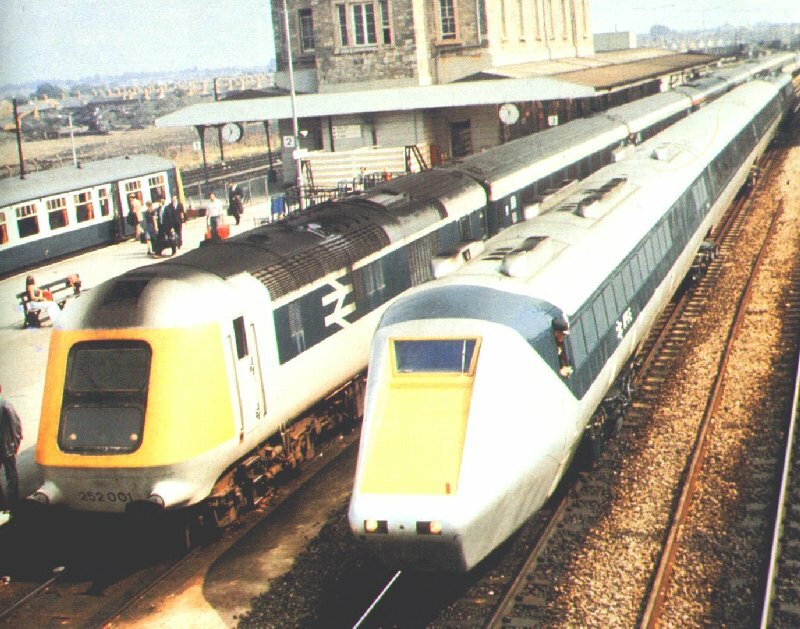 This is a composite picture of the original publicity material for the HSDT from 1972. 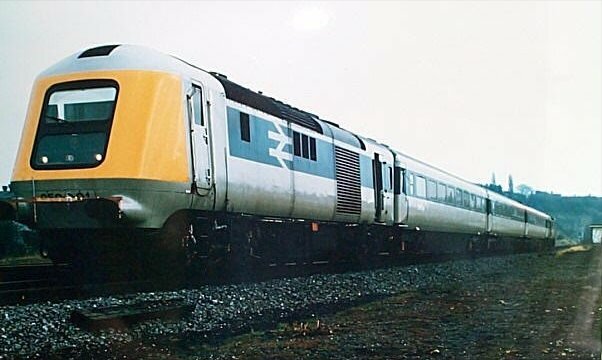 Unfortunately it doesn't join very well! 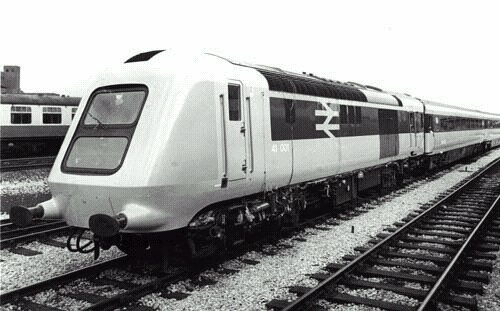 Once the power cars were completed at Crewe they were hauled to Derby where they were assembled with the Mk3 coaches which were built in the C&W Works to form the complete unit. 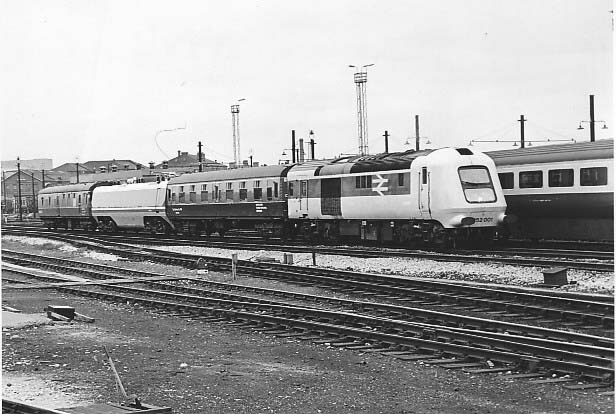 One of the two HST prototype power cars 41 001 pictured in the loop at the top of the RTC yard having just arrived from Crewe on 11th June 1972. 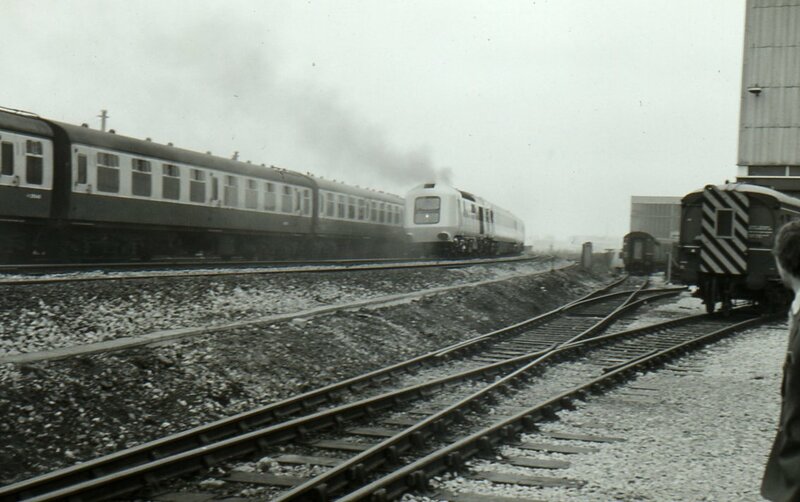 Note the brake van! 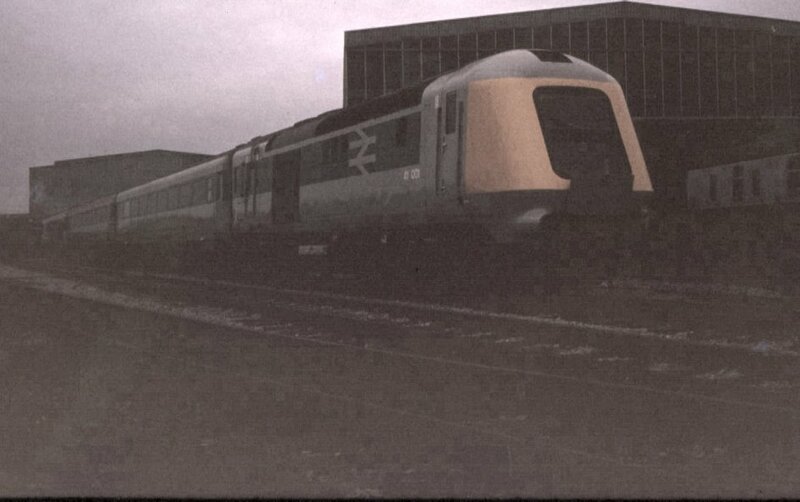 41 002 arrived a couple of months later. 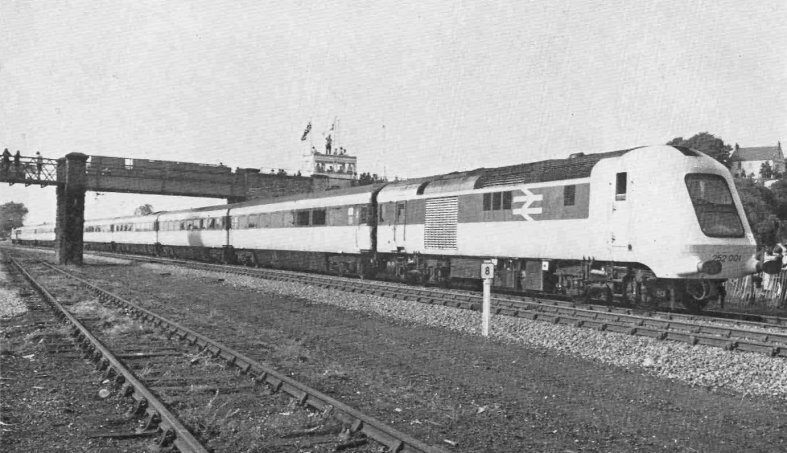 Pictured fresh from the C & W Works, in the consist of the Mk2D acceptance trials train, E12002 is seen parked in St Andrews Goods Yard during the spring of 1972. 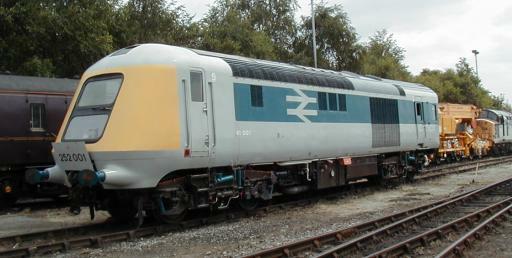 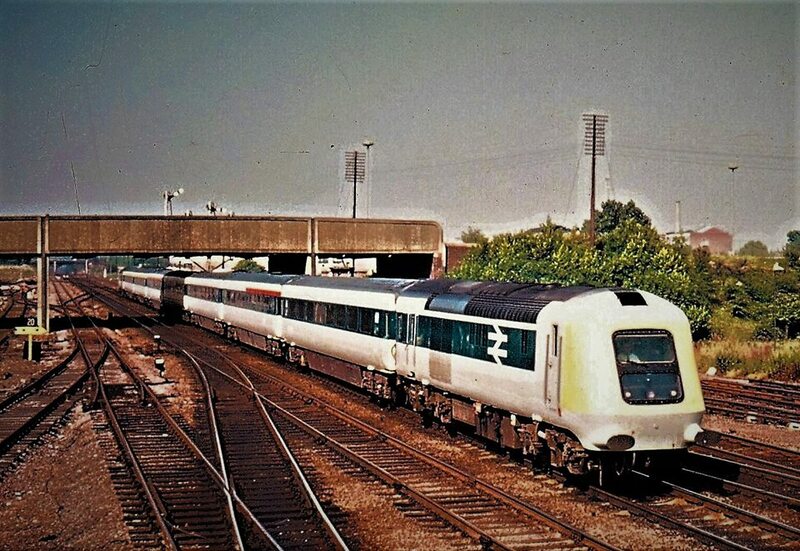 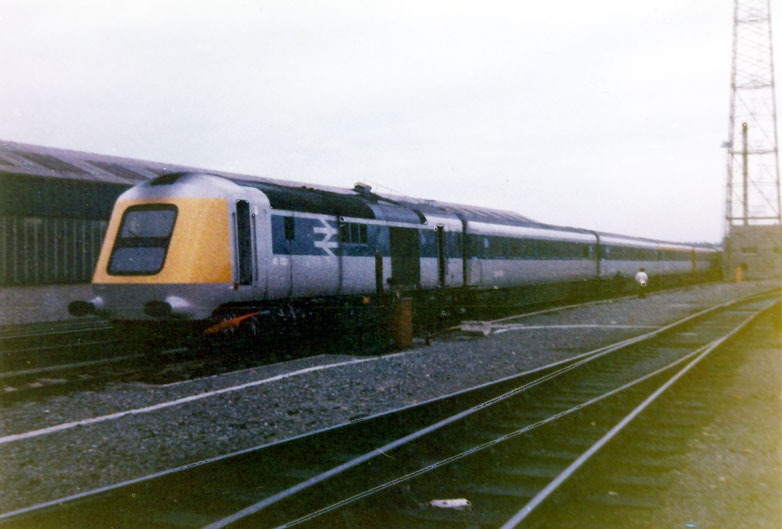 The first of several Mk3 coaches which were to form the prototype HST set. 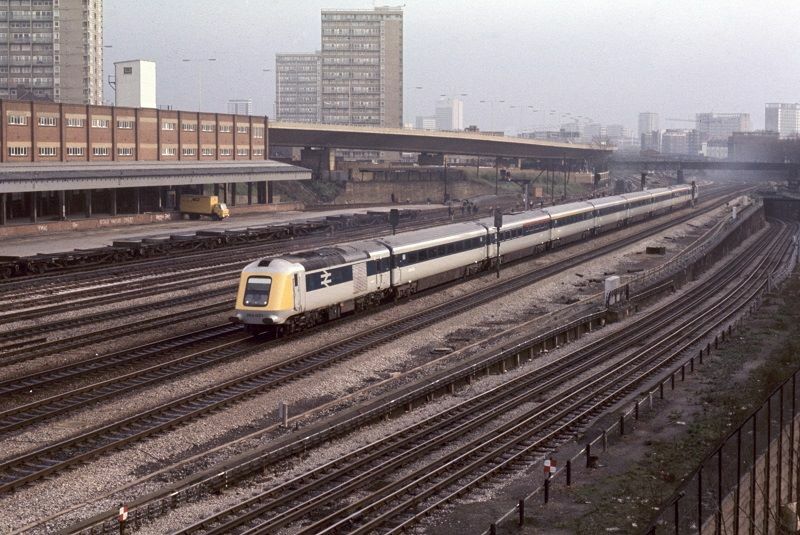 Note the new Post Office building under construction in the left background. 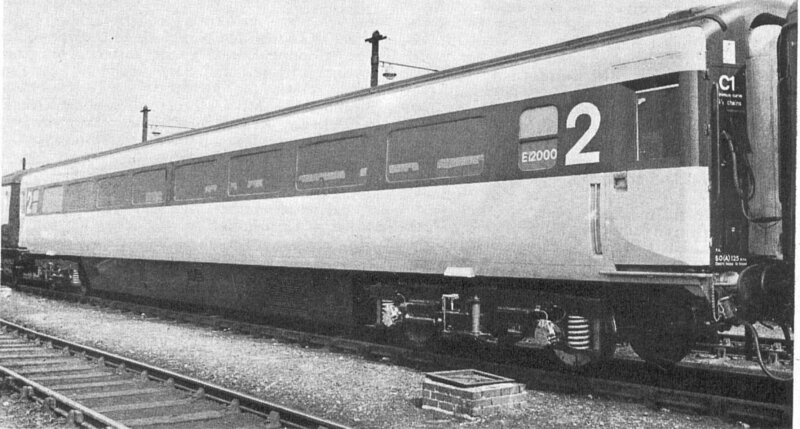 A closer view of E12000 at Cricklewood after a trial run - note the running number in the toilet window - an idea which was soon abandoned. 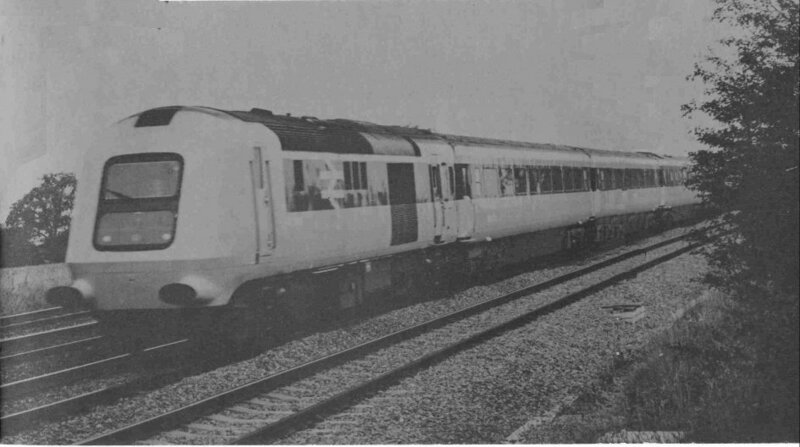 Note the C1 route restriction code later amended to C3. 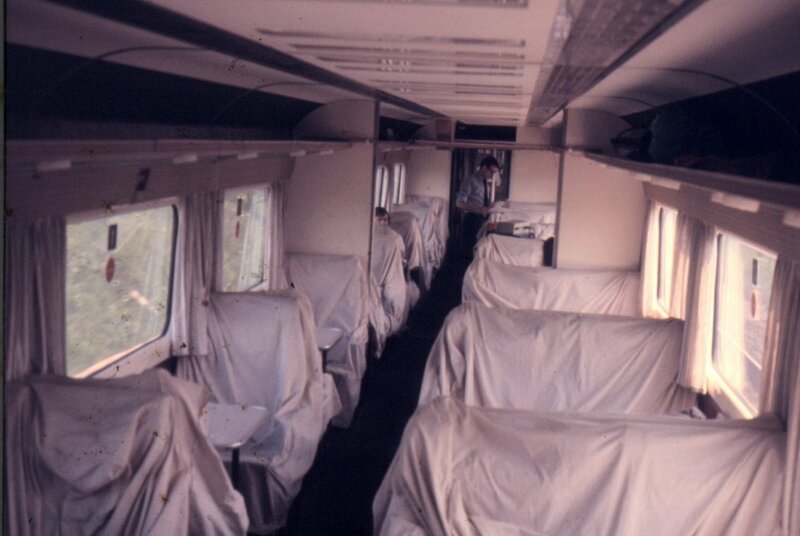 BR test engineers set up their equipment inside one of the coaches which was fitted with dust covers to protect the seats 41 001 at the head of the set stands on the Way & Works Sidings at the RTC at Derby during its early testing days. 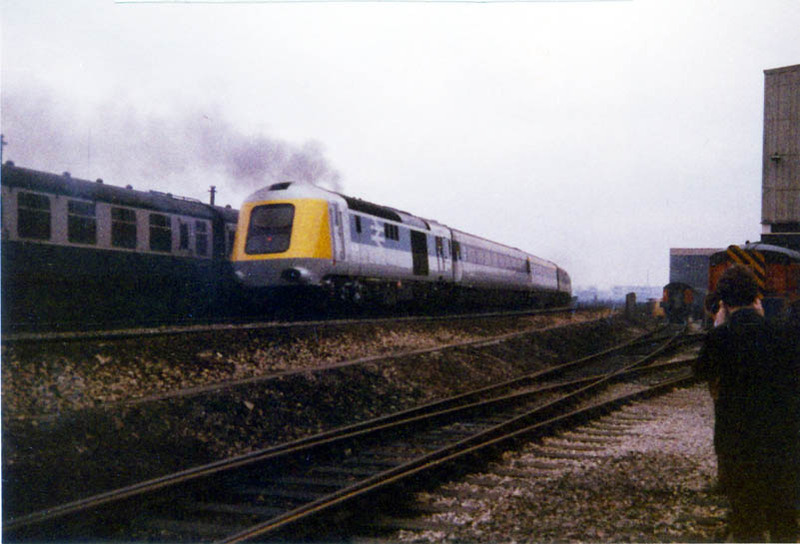 BR Official On a misty day in February 1973 the HST set passes the RTC yard on its first run - note ex-LMS Dynamometer Car - now Test Car No:3 - behind the leading power car. 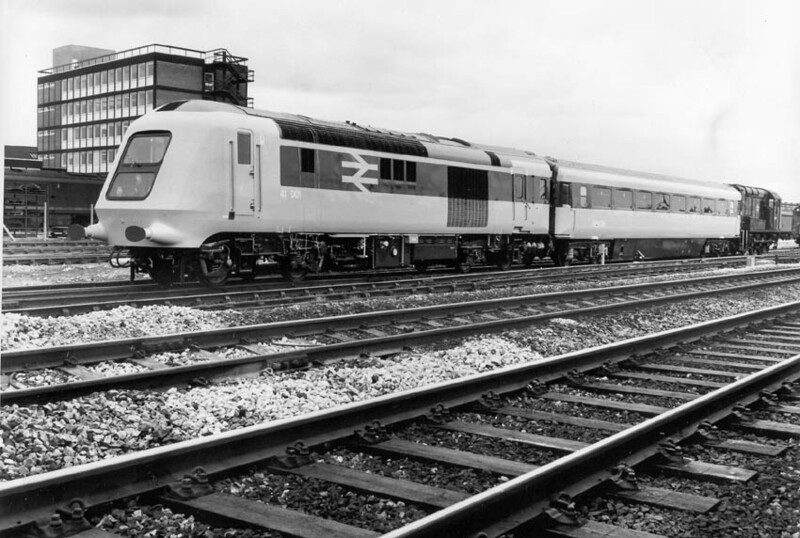 Leaving a nice trail of smoke the HST disappears towards Trent Junction A black and white version taken a few seconds later. 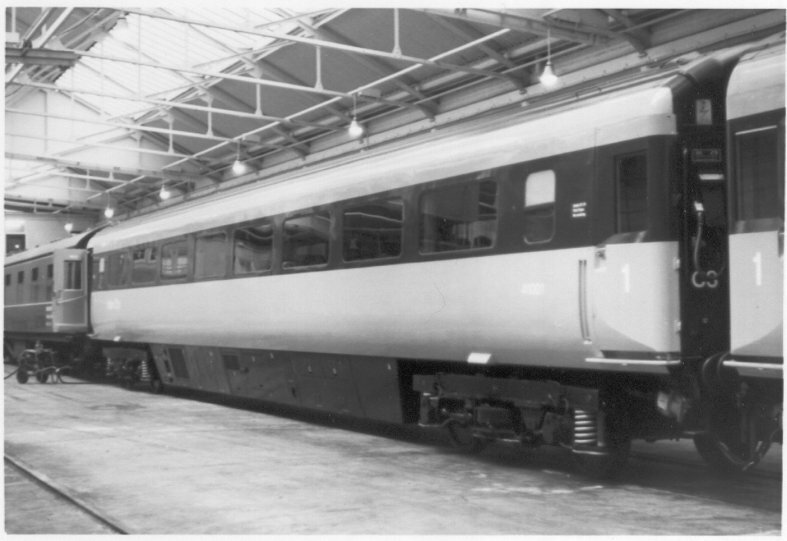 Note ex-WR Test Car 4 on the right with the wasp striped corridor door. 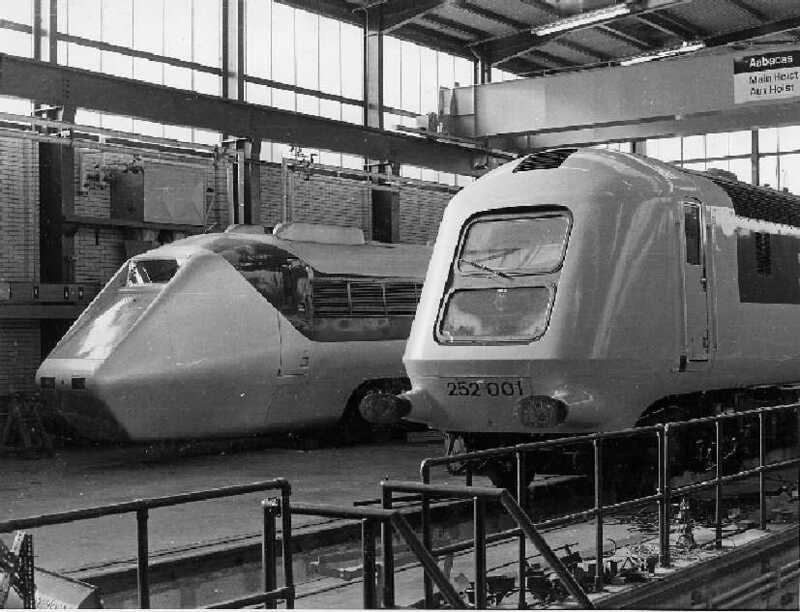 Another shot at the Technical Centre sees the unit standing in the sidings outside the EDU with the Vehicles Lab in the background Pictured next to its revolutionary rival APT-E in the Vehicles Laboratory workshop at the Research Division, Derby in October 1974. 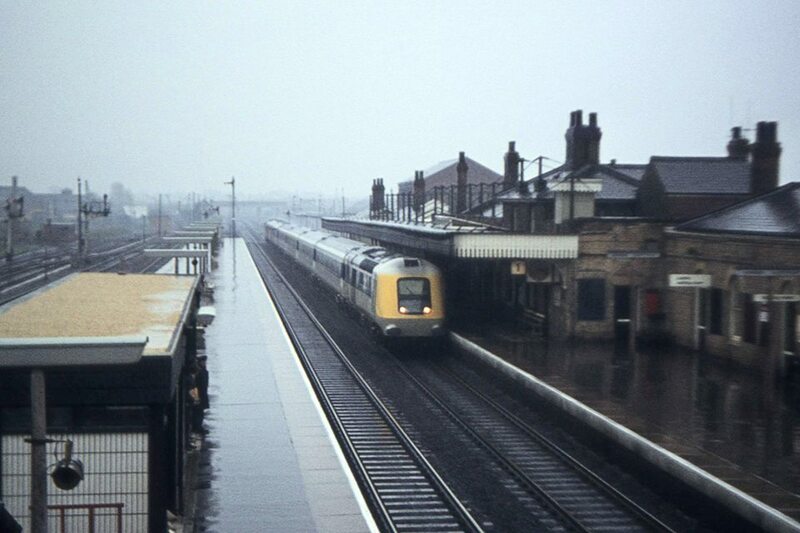 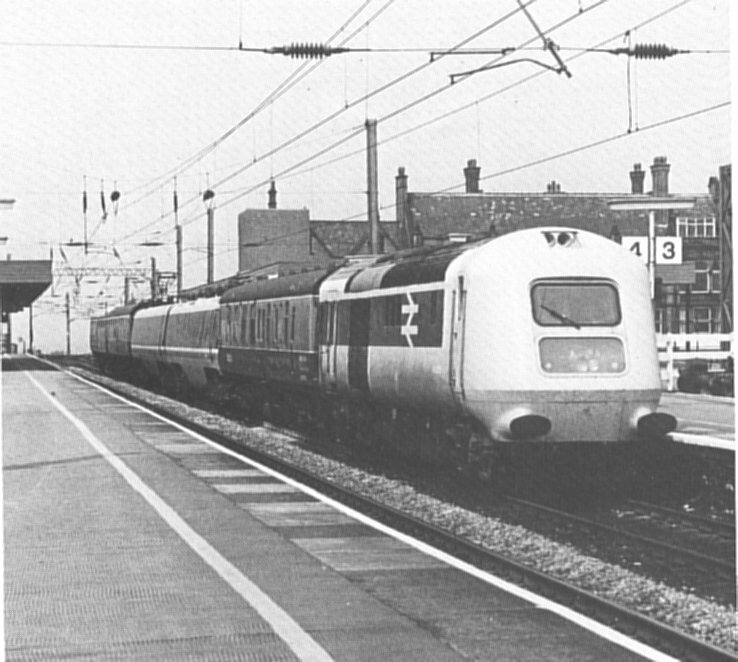 The unit underwent a number of high speed runs on the ECML between York and Darlington commencing on 5th May 1973. 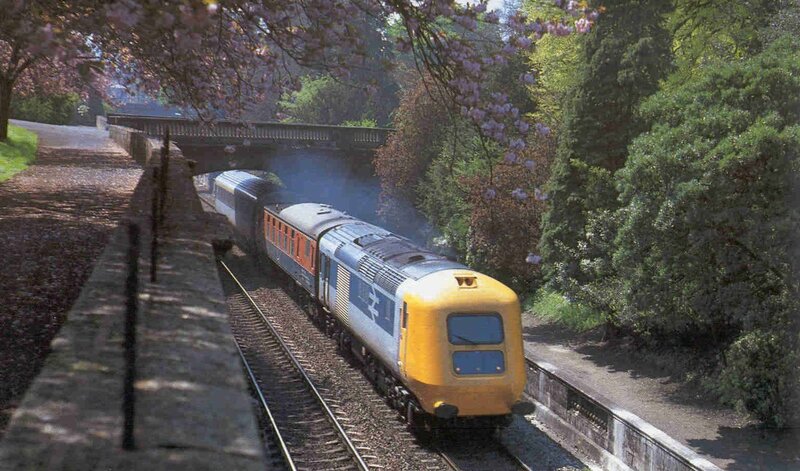 During June the set ran up to 140 mile/h and on June 12th attained a world speed record for diesel traction of 143.2 mile/h in the Northallerton area. 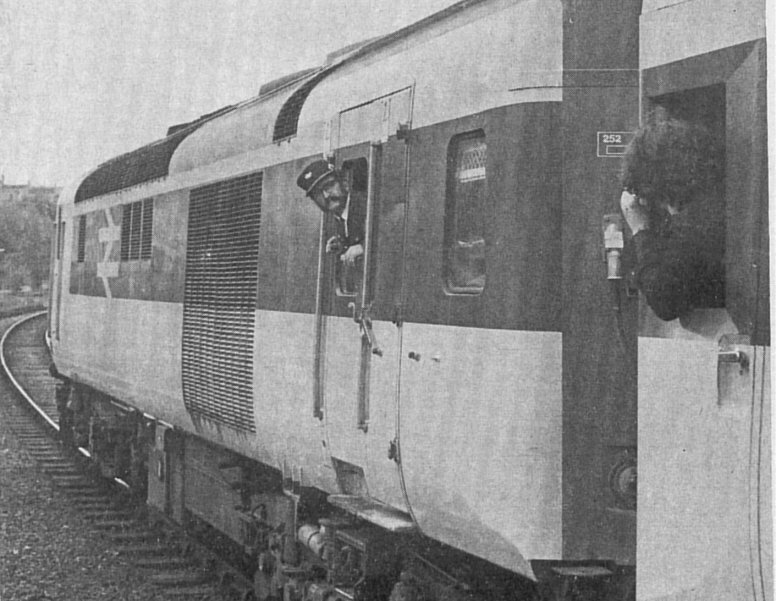 The emblem at the head of the page is taken from the special commemorative tie which was issued after the event. 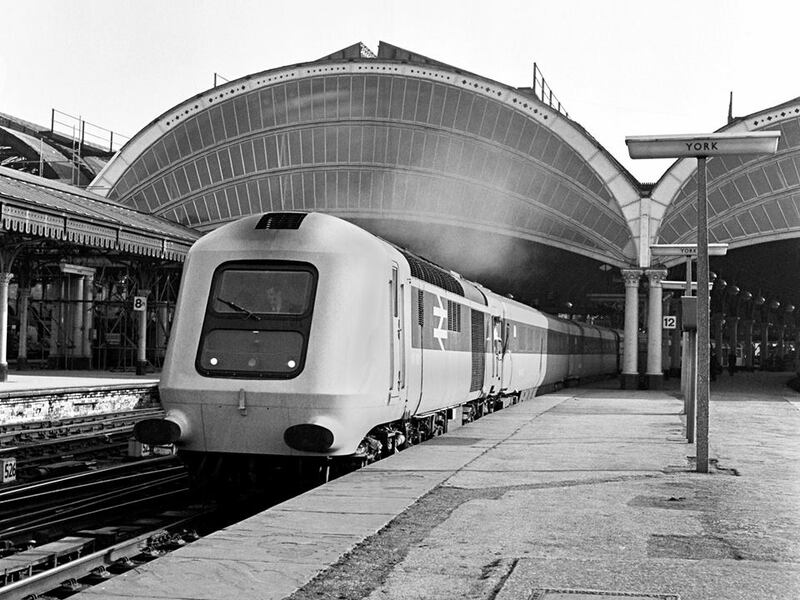 Norman Preedy A Mk3 2nd class buffet E10000 was later included in the formation and is pictured on 11th November 1974 in Longsight Carriage sheds after being removed from the HST set. 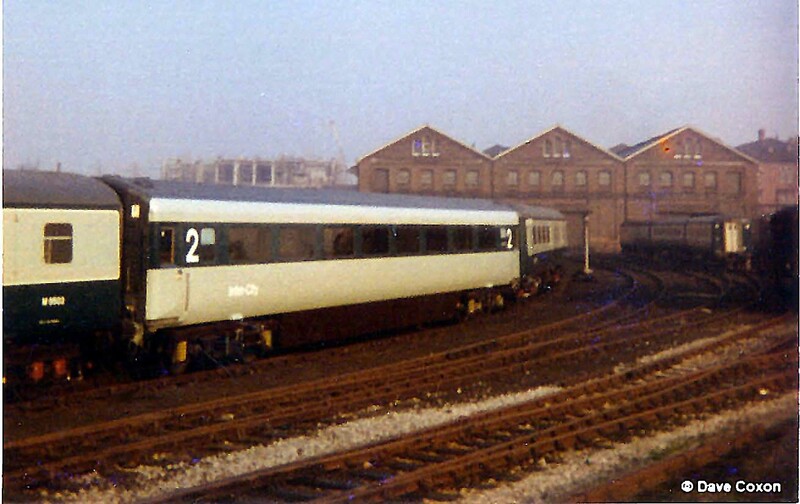 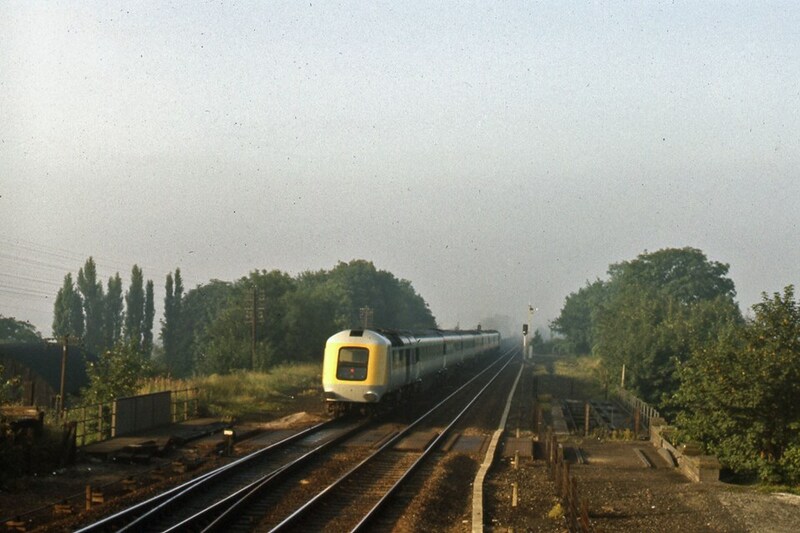 This was later converted into R&DD Lab Coach 15 'Argus' and later became DM&EE's Test Car 4. 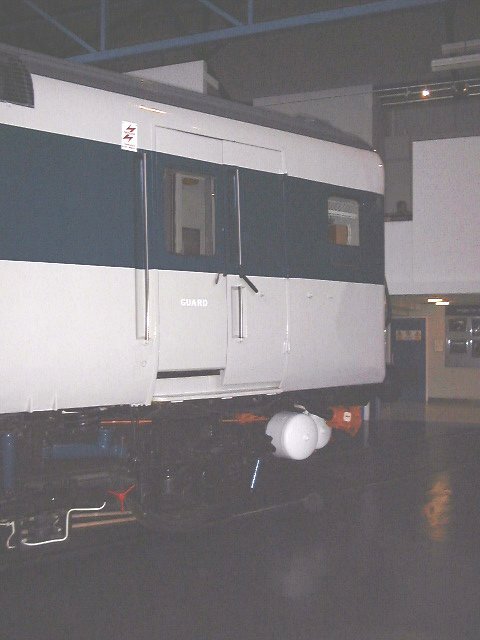 It survived being cut up in 2003 and ended up in the NMT. 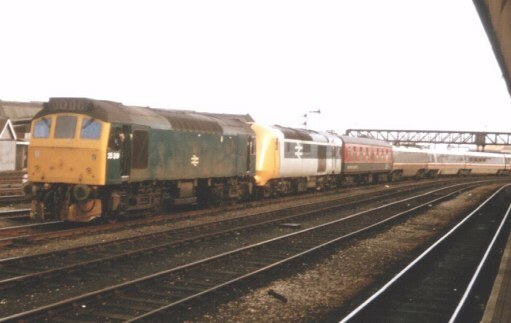 The set also ventured onto the WCML. 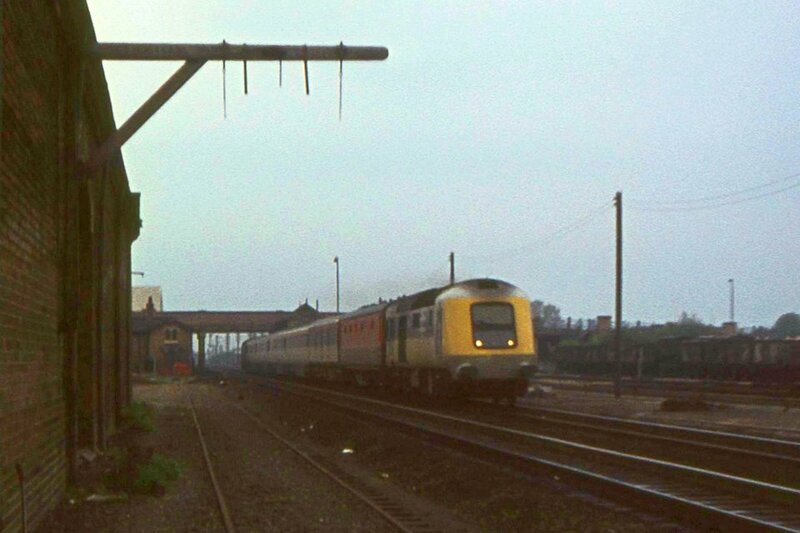 It is pictured here in the Down Loop at Beattock Station in March 1974 short-formed into a 2 + 2 set for reasons lost in the mists of time. 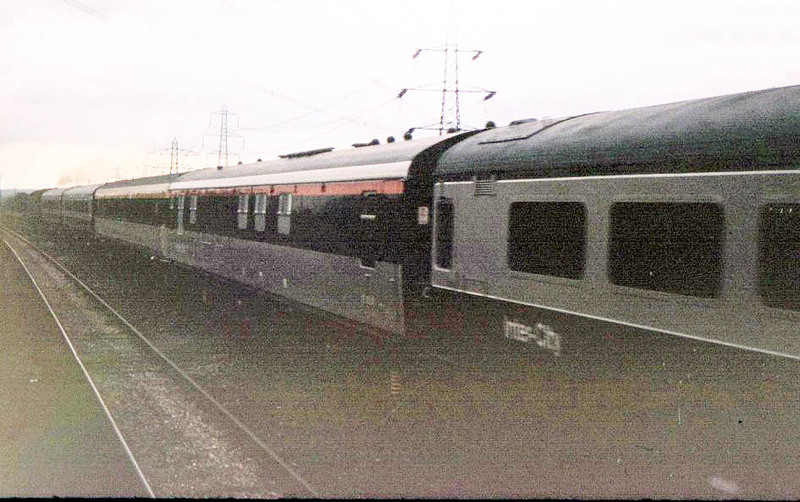 Mick Wright Testing was also carried out on the Western Region based at Old Oak Common depot. 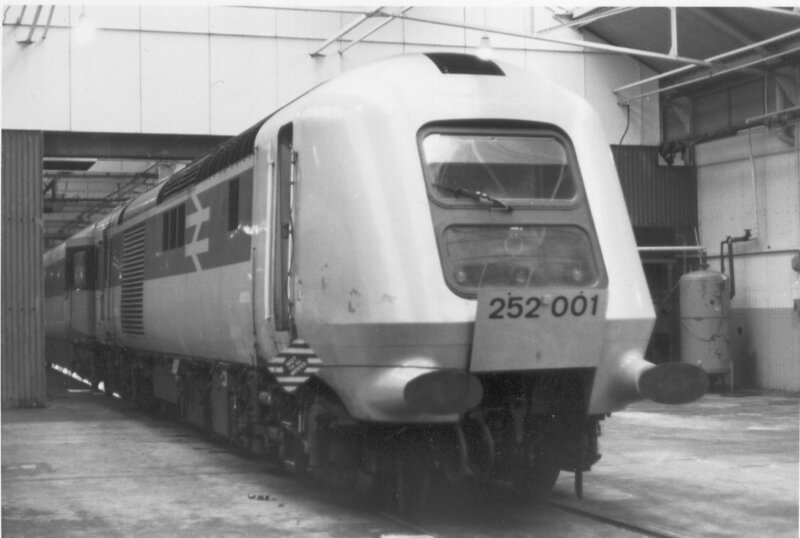 Here's re-numbered power car 43001 on set no:252 001 sticking out of the Paint Shop at OOC in 1974. 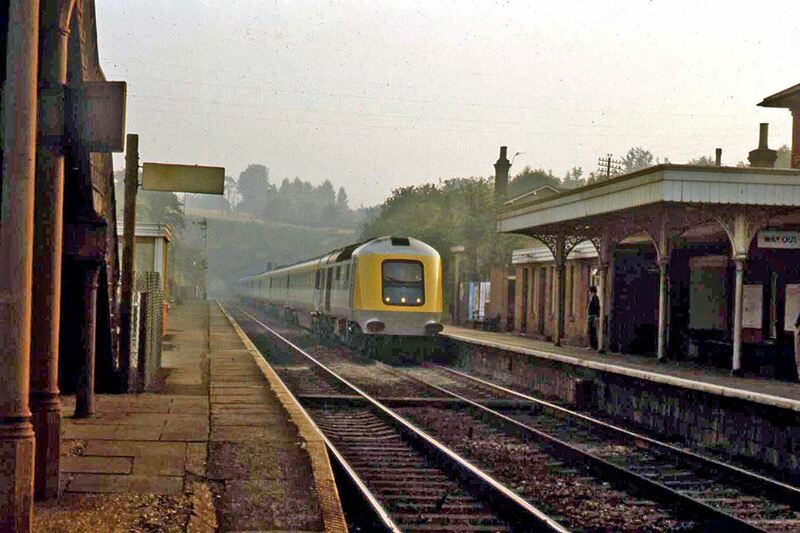 Here it is on 28th January 1975 pictured at Tavistock Jcn on the Up Relief line. 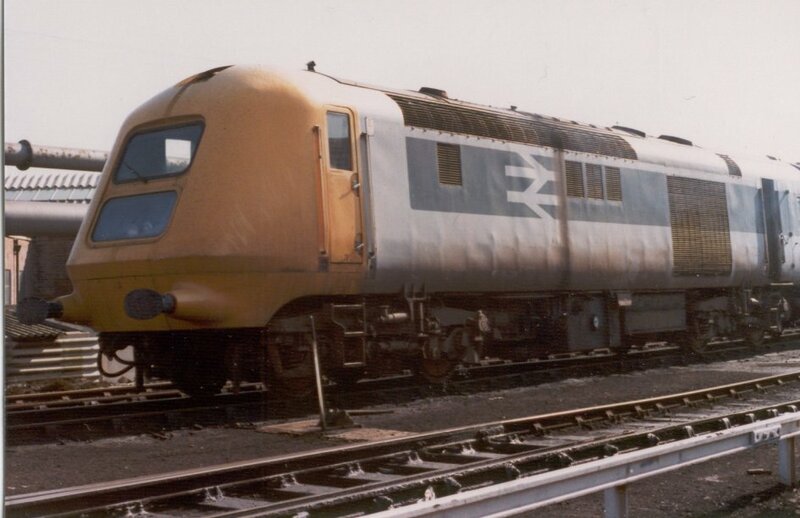 It is thought to be on a Press special but has instrumentation fitted in the cab (perhaps an intercom) evidenced by the cables. 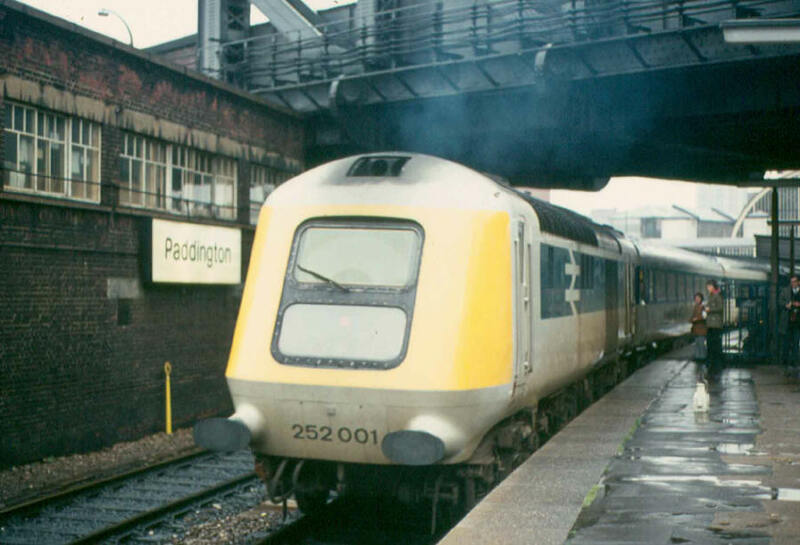 Ian Walmsley On 5th May 1975 prototype set 252 001 stands in platform 4 at Paddington on its first day in service. 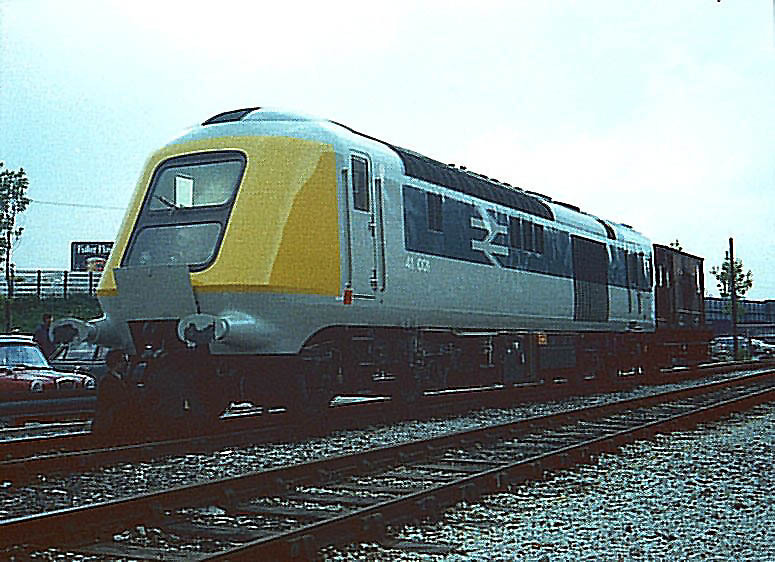 The rear power car now numbered W43001 at Paddington on the same day. 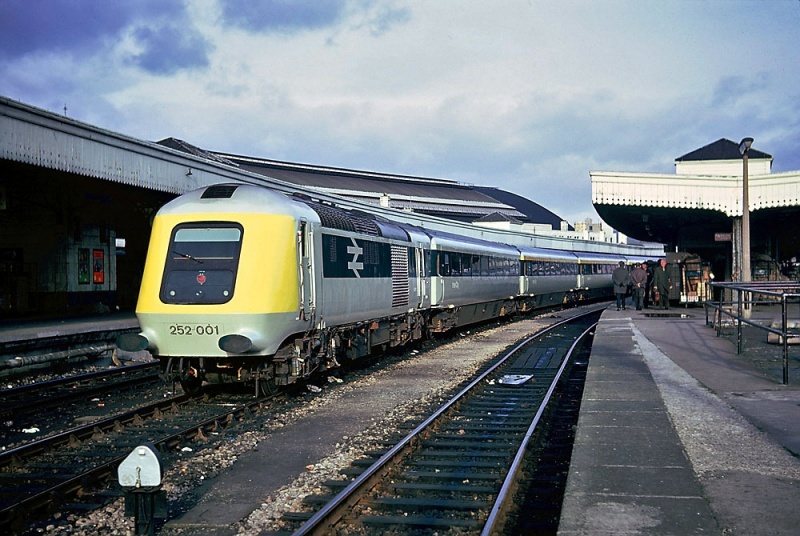 Ivo Peters In September 1976 set 252 001 rolls into Swindon's platform 3 with a Down service including production Mk3 coaches. 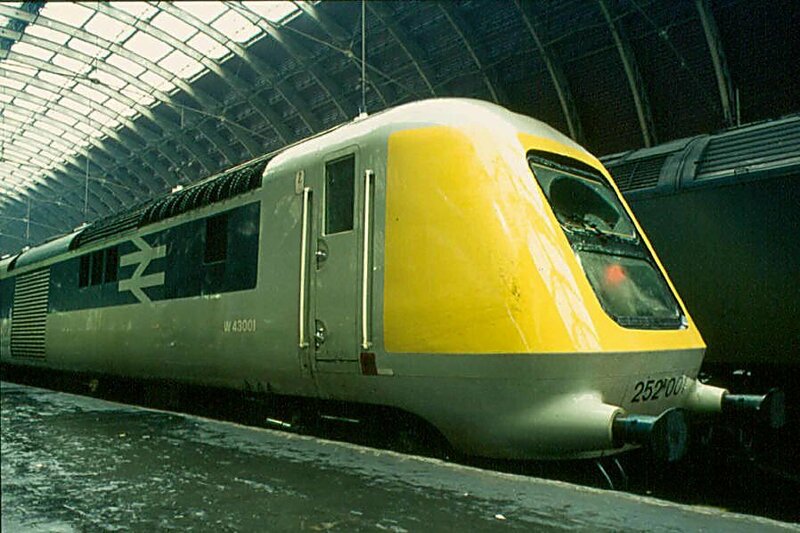 By this time the original livery was looking decidedly jaded. 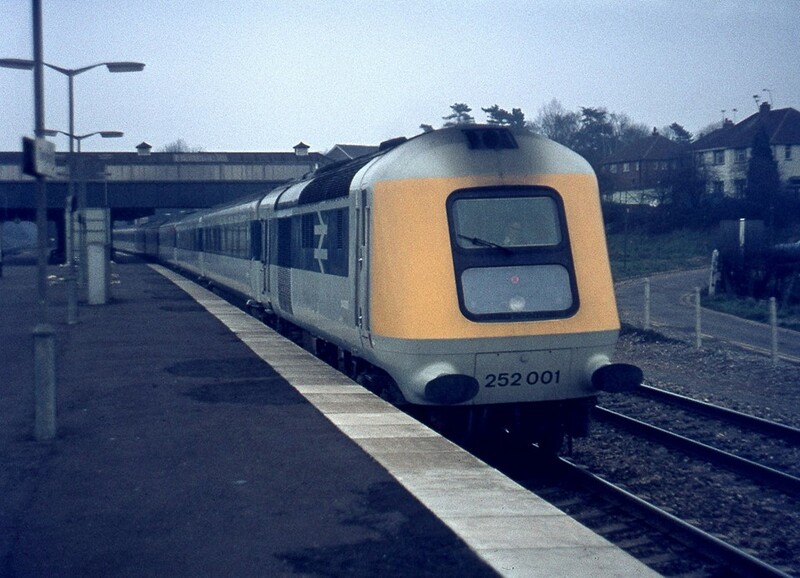 252 001 in original livery heads a London-bound service on the Up Through road at Reading sometime in 1976. 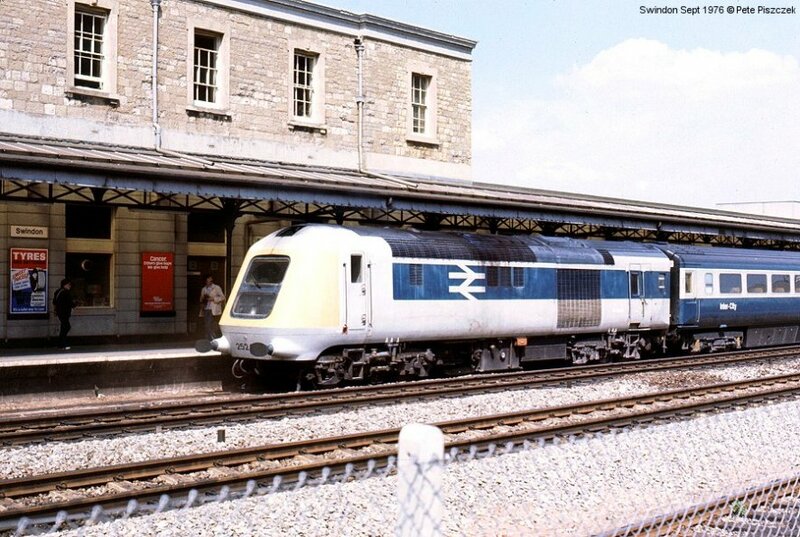 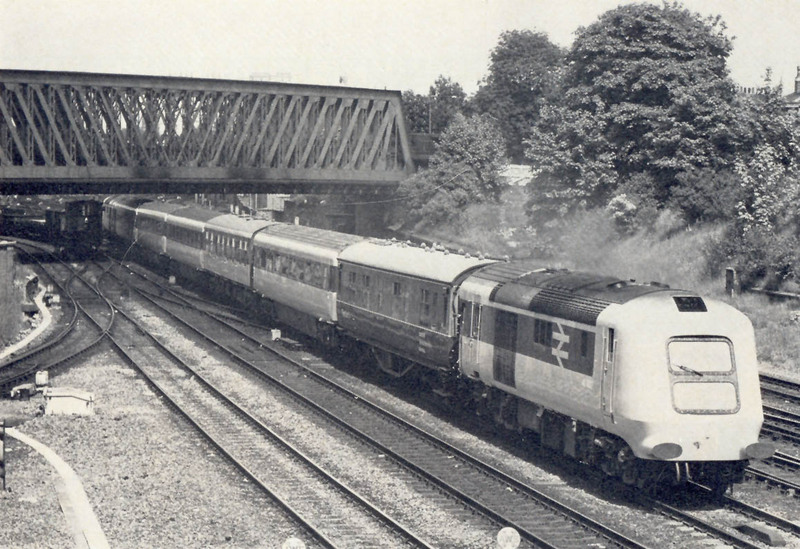 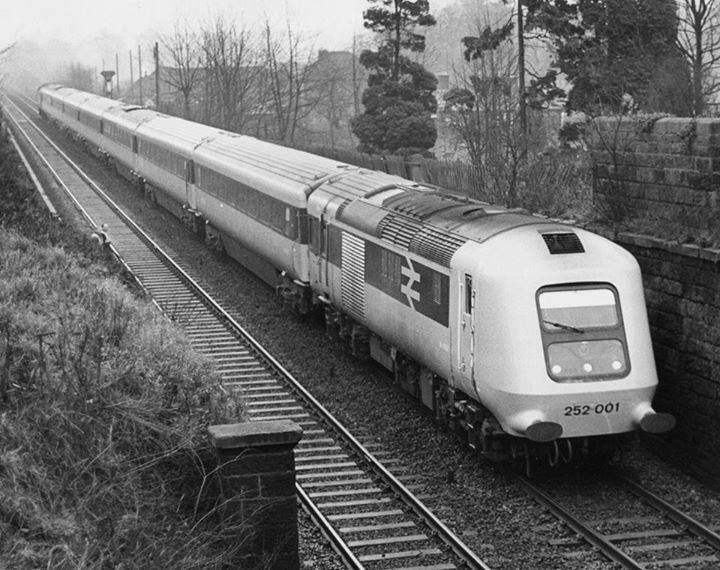 252 001 High Speed Train passes through Keynsham Station in June 1975. 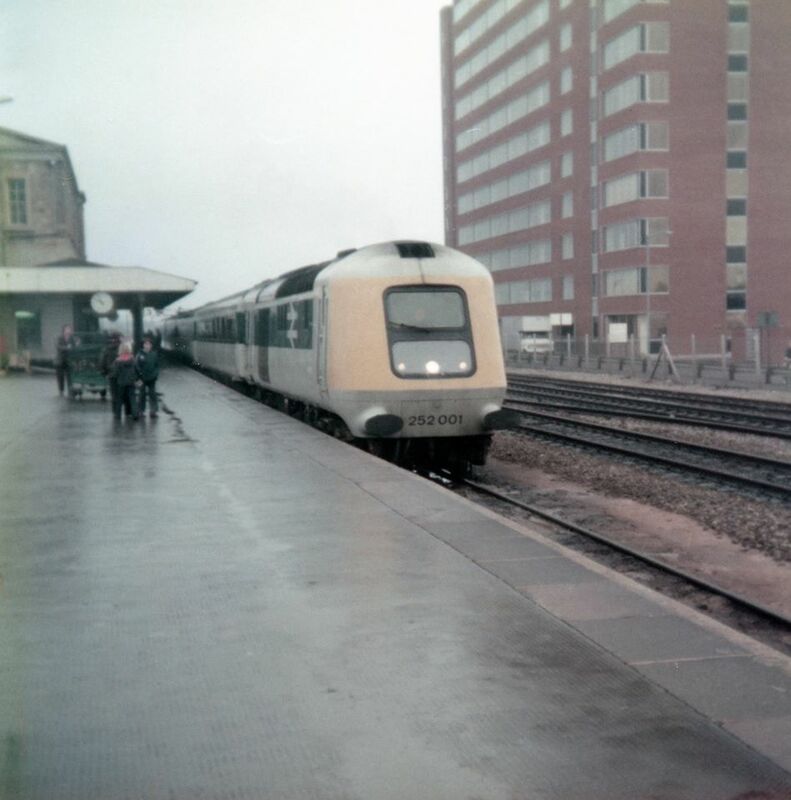 In August 1975, the set is pictured in platform 3 at Swindon on the 10.15 Paddington to Weston super Mare service alongside the APT-E train . 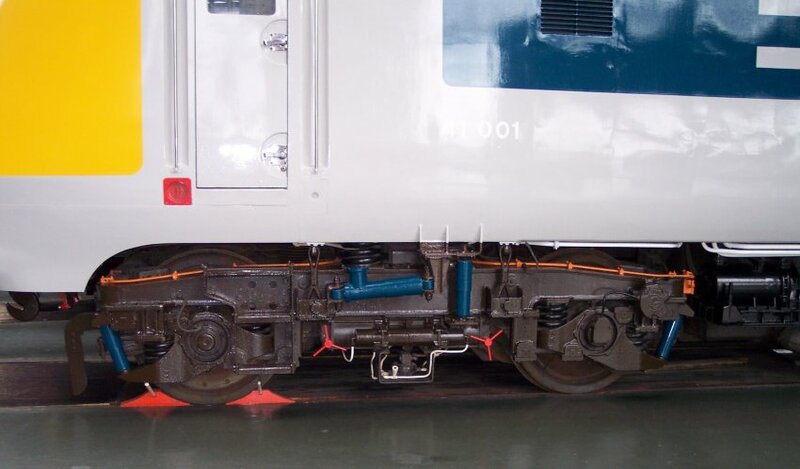 Note the black marks over the roof left by the exhaust on the trailing power car. 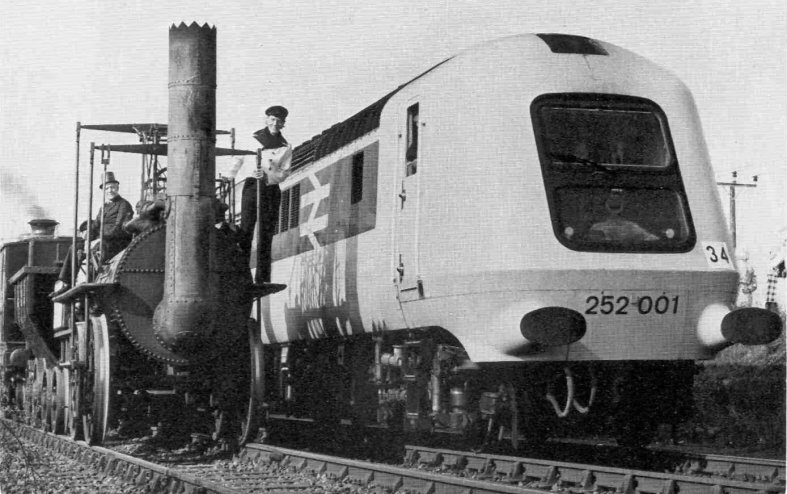 This was later overcome on the production power cars by the fitting of a cowling above the cab roof, which deflected a flow of clean air beneath the exhaust flow. 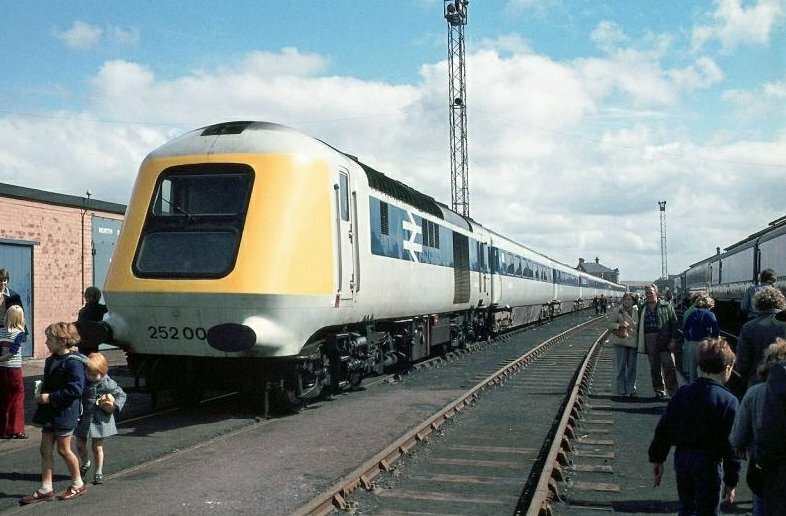 The HST was included in the celebrations to mark 150 years since the opening of the Stockton & Darlington railway at Shildon, Co. Durham on 31st August 1975 where it was the last in the cavalcade of rolling stock. 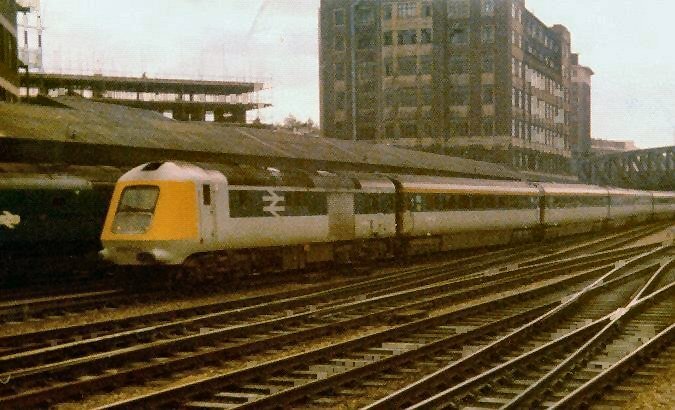 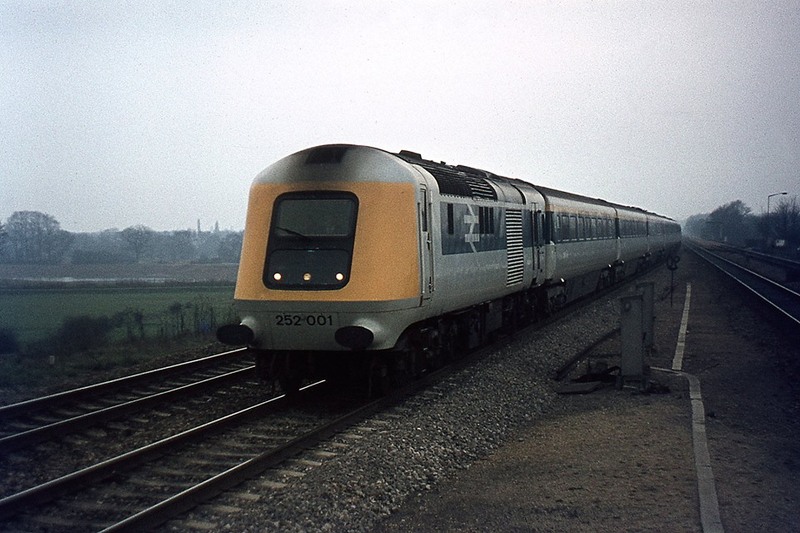 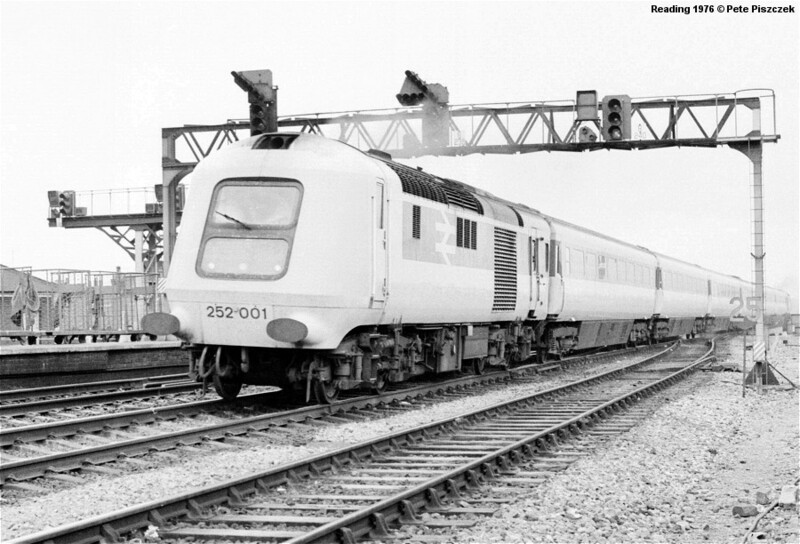 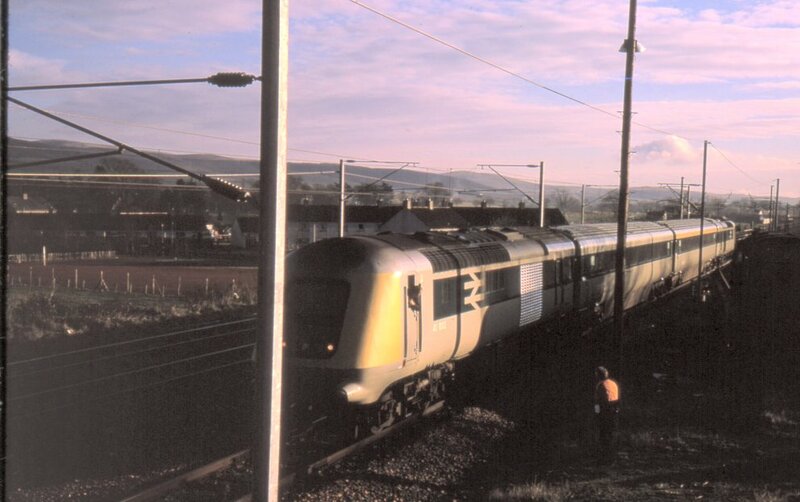 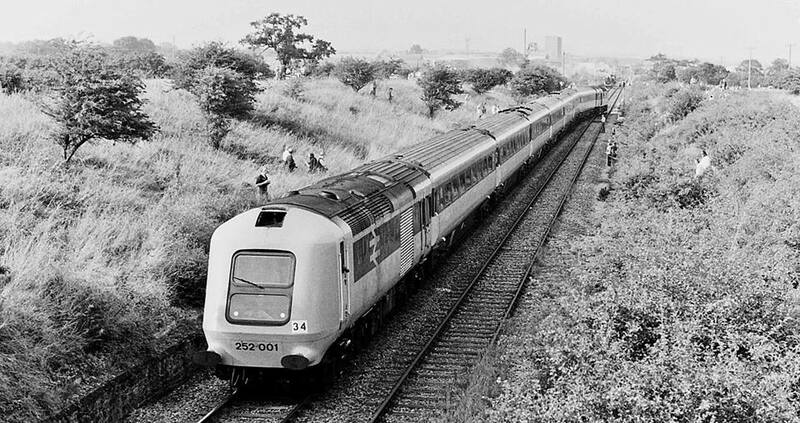 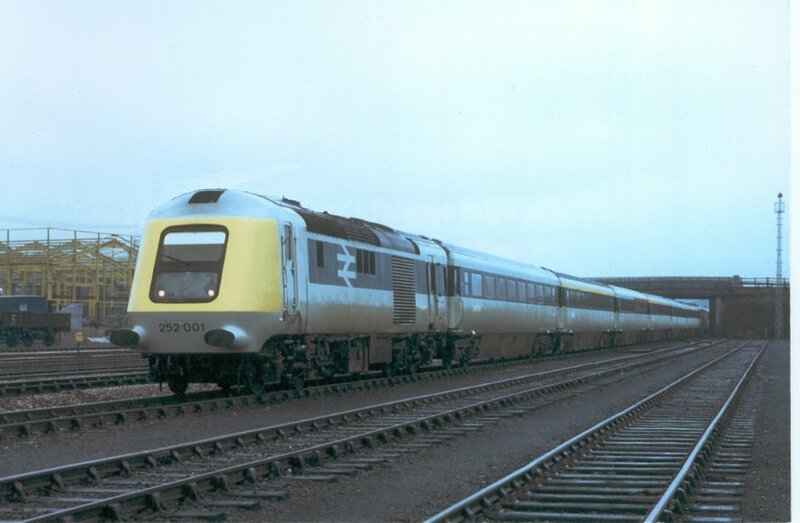 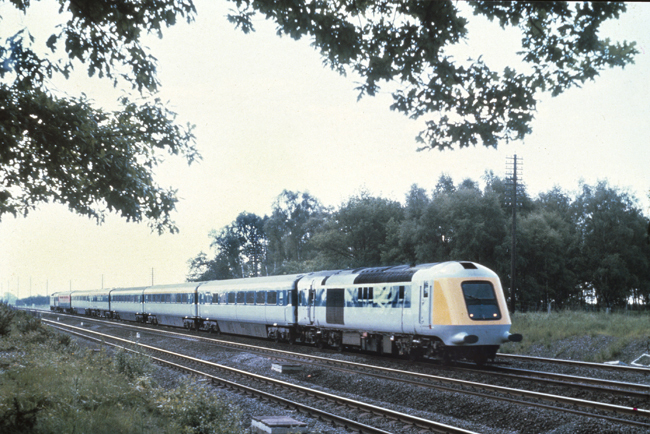 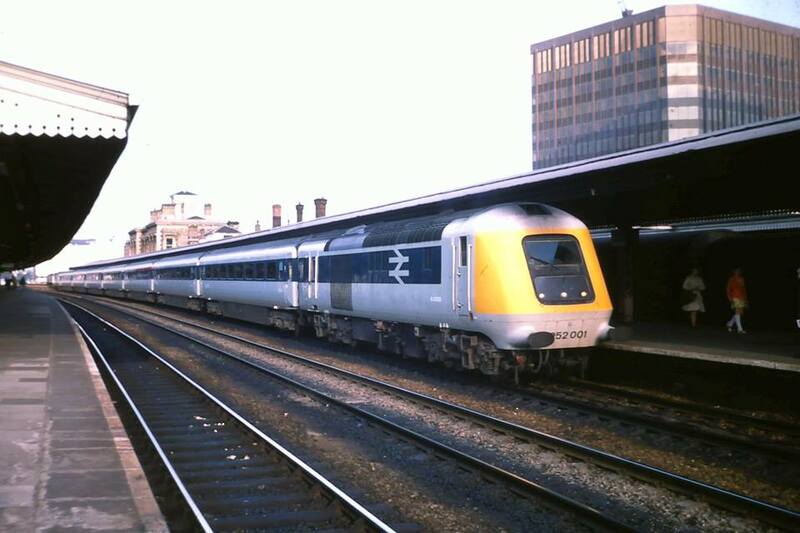 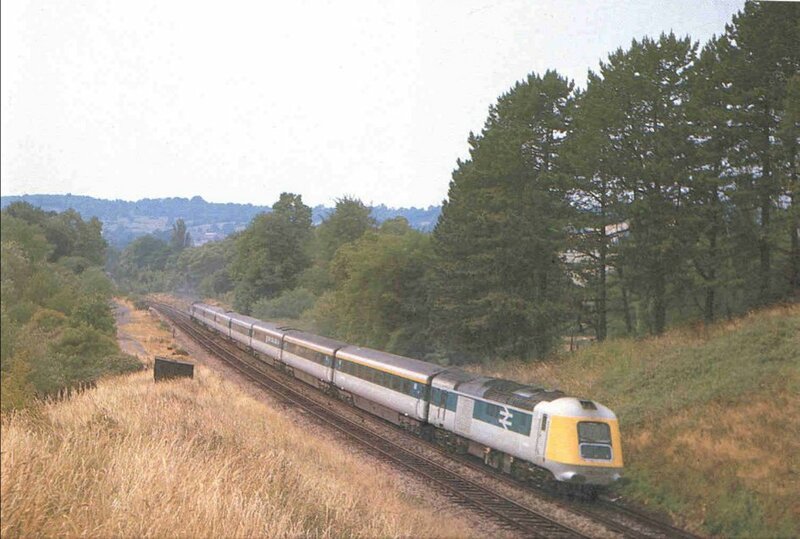 Following the widespread introduction of production HST's the prototype power cars were withdrawn from service in late 1976 and returned to the RTC at Derby where they were taken into Departmental stock. 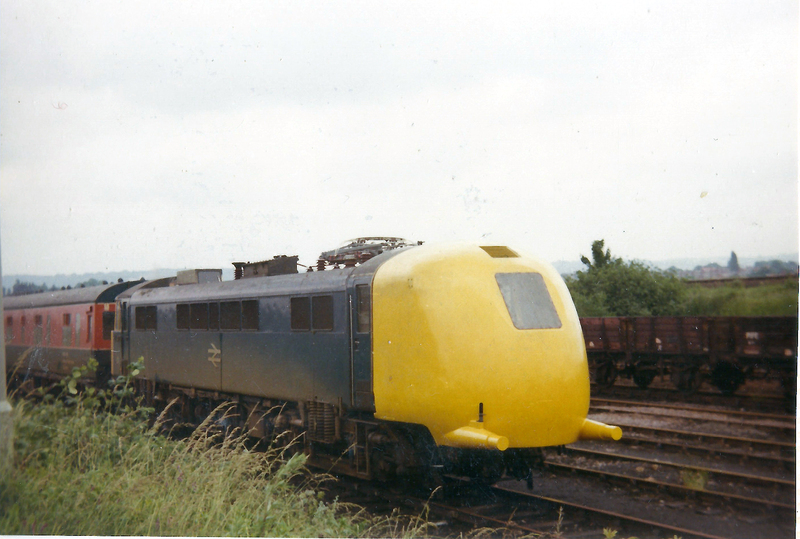 They were re-numbered as ADB975812/3 and used for a number of years to haul various test trains. 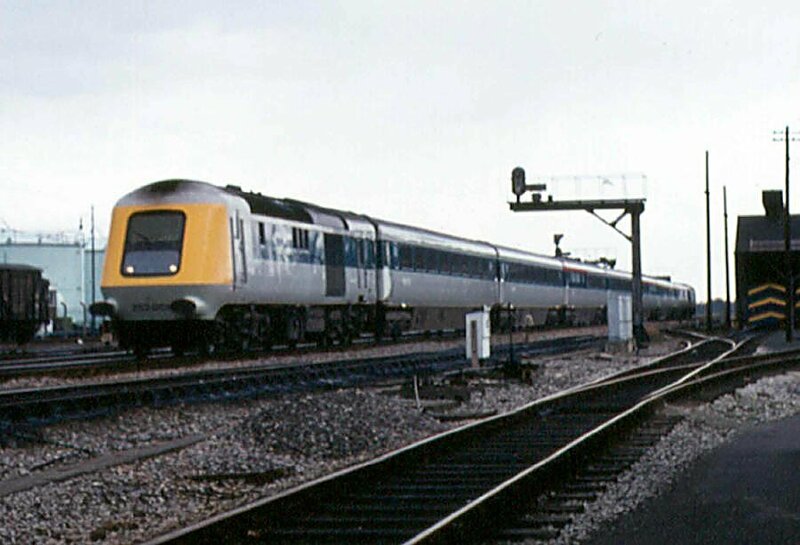 There was even talk of converting them to straight electric traction when the 'electric HST' was being considered, but it was not to be. 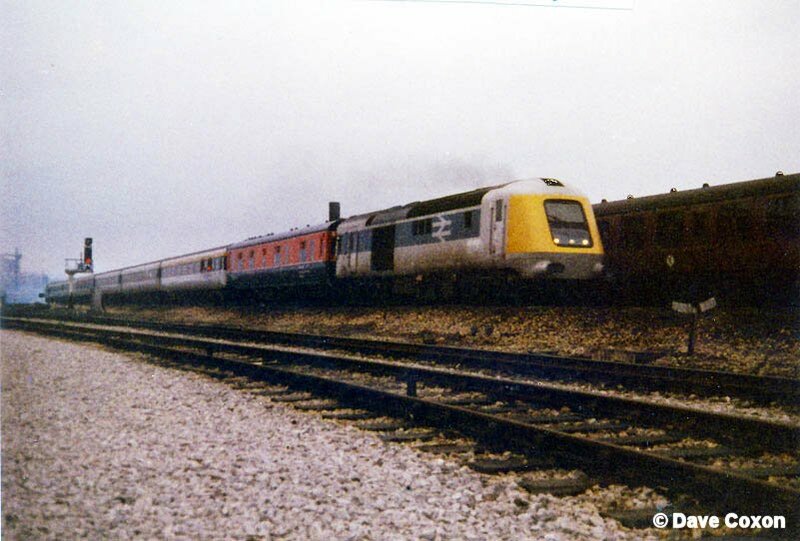 Alan Rimmer On 17th May 1978 one of the power cars heads a test train with two APT-P power cars in the formation through Wigan North Western station. 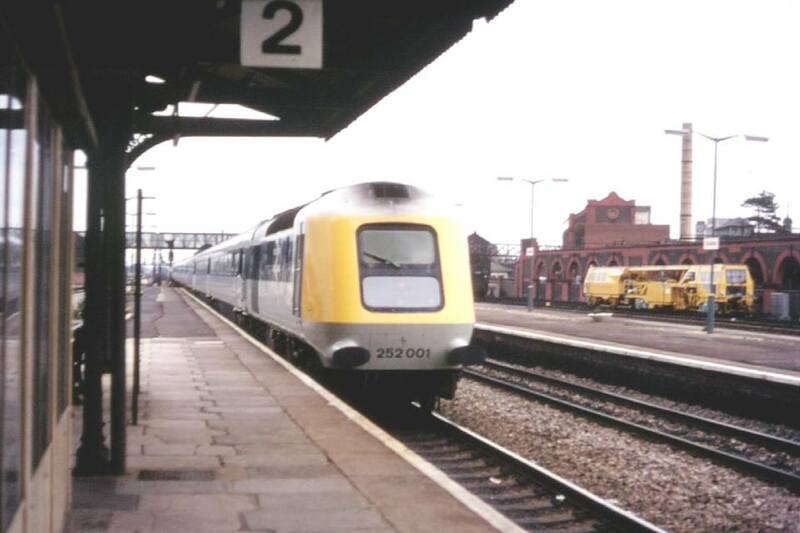 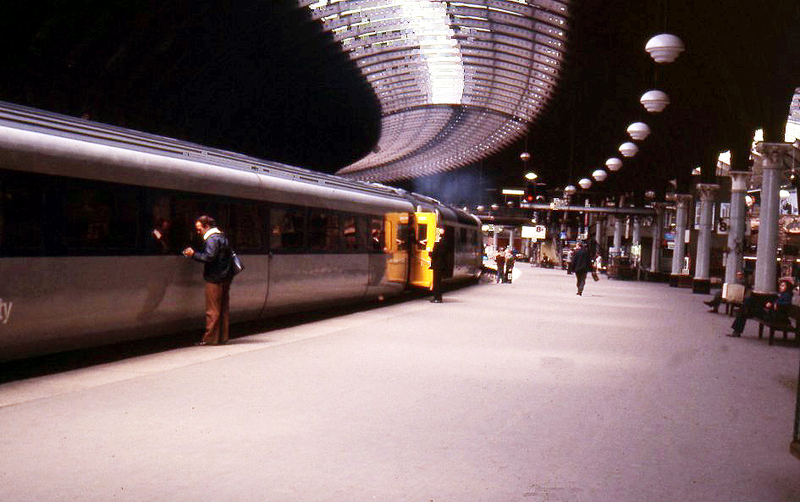 Another test train is pictured at Derby with the prototype power cars and some APT-P vehicles in March 1979. 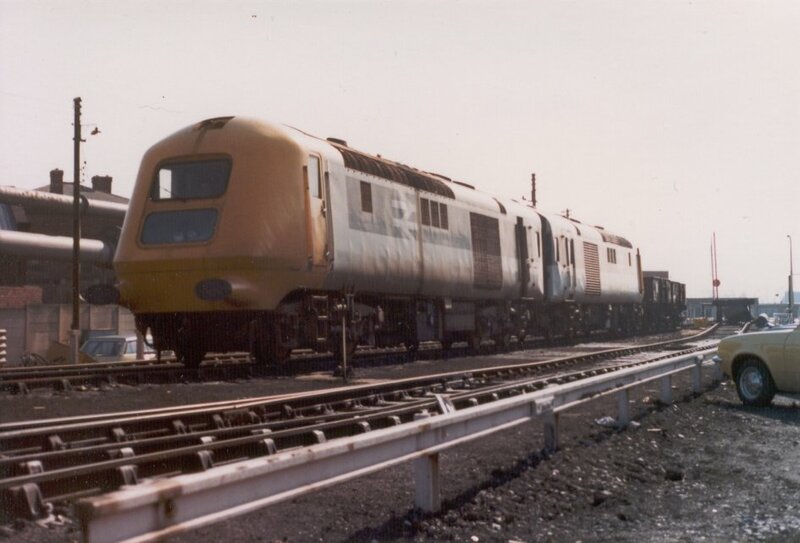 Dave Godfrey The two power cars were often stabled at the back of Etches Park depot in Derby, where they were pictured in April 1980. 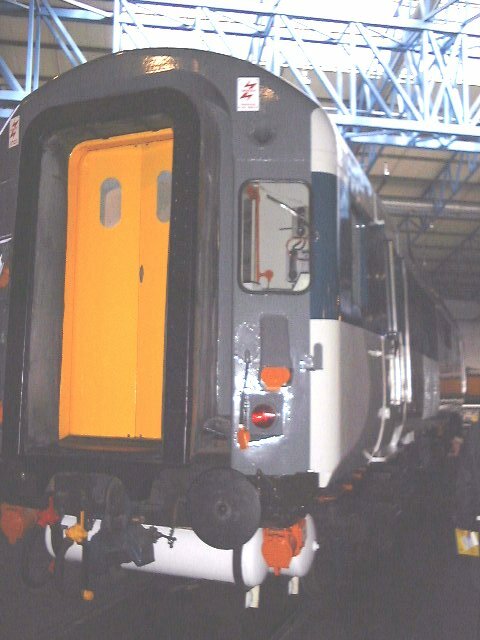 A close up of one of the power cars shows that it now has two headlights fitted behind the front panel - possibly for test train work, the original set number has now been removed but it carries no departmental number. 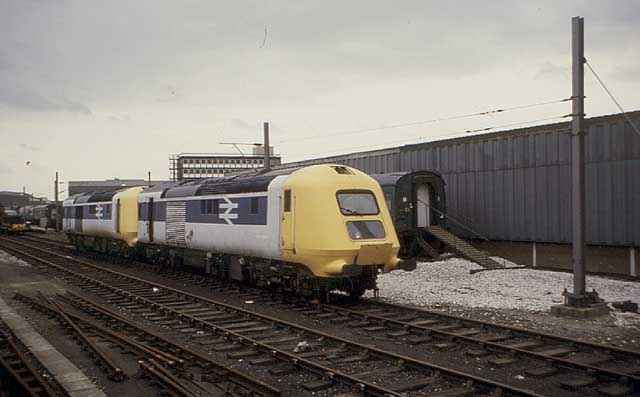 Dave Godfrey In March 1983 the two power cars are pictured out of use on the scrap road at Derby Locomotive Works. 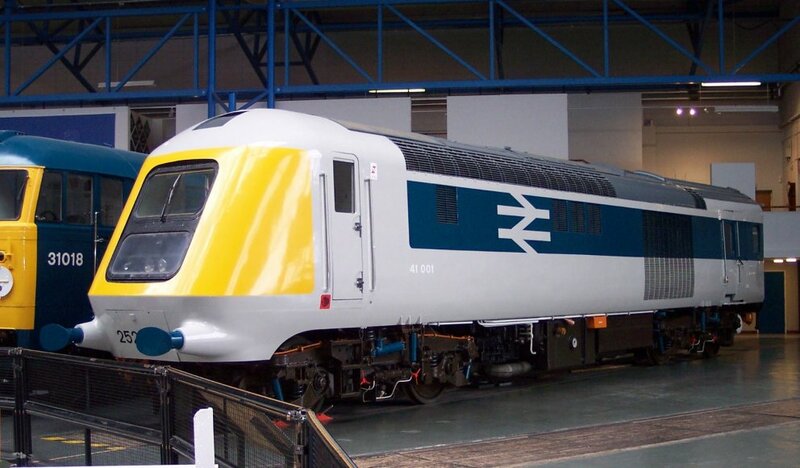 Their fate would be quite different, one was scrapped at Rotherham in 1990 and the other still survives today as part of the national collection at NRM and is now fully operational and based at the Great Central (Nottingham) Railway ay Ruddington. 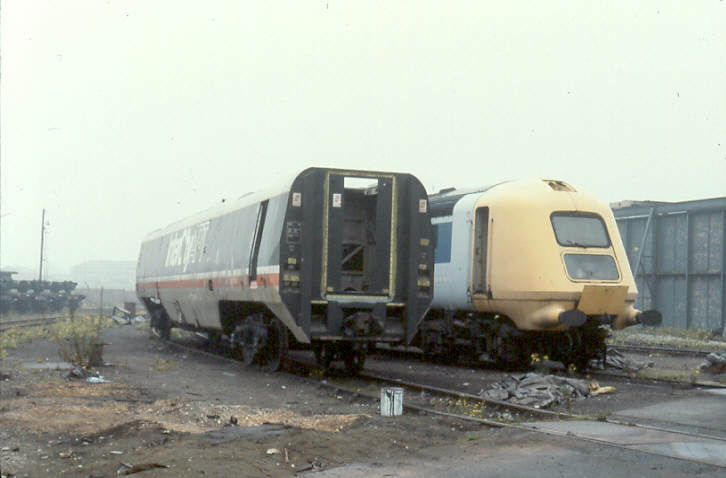 In October 1986 975813 was still to be found inside the works, alongside one of the APT-P power cars, both awaiting their fate. 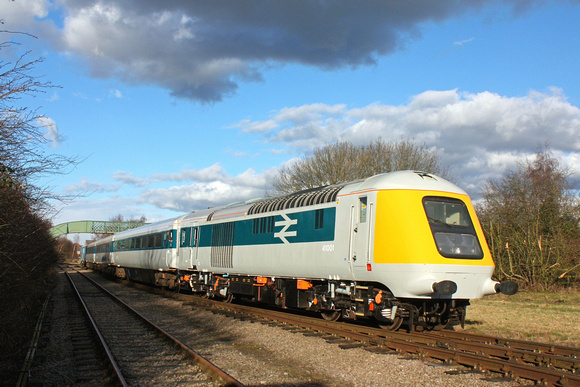 Plans were announced by the 125 Group in May 2011 to return 41001 to service, under the banner of Project Miller (named after Terry Miller, formerly Chief Engineer (Traction & Rolling Stock) for British Rail). 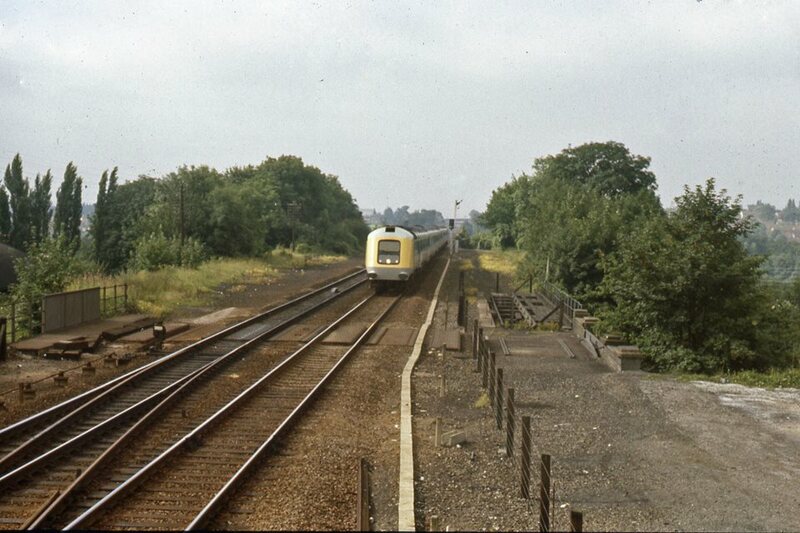 The power car is now on long term loan based at the Great Central (Nottingham) Railway at Ruddington.